A grab from the video posted on Facebook, and Asit Rai after his arrest. 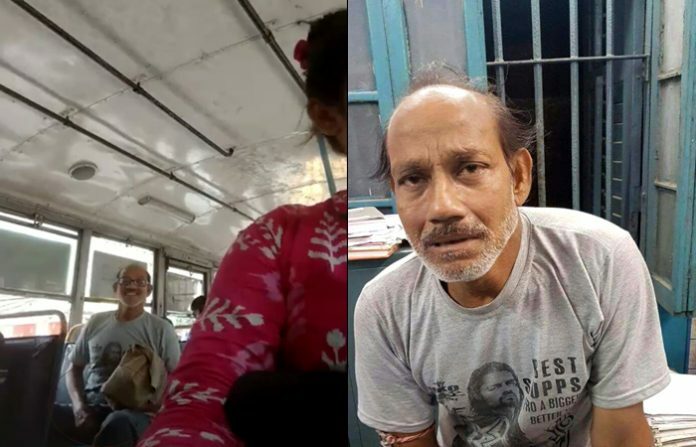 Kolkata: Police this evening have arrested an elderly man for masturbating at two college girls inside a bus in north Kolkata. Asit Rai, a hawker by profession, has been arrested from Shyambazar area in the city. Rai, in his late 50’s, is a resident of Baidyabati in Hooghly. 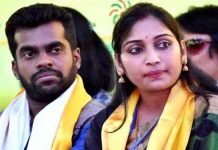 The arrest comes after a college girl named Priyanka Das posted on Facebook two videos wherein Rai could be seen seated on a rear seat of a bus and masturbating while ogling at Das and her friend seated on a front seat. This happened when Das, a student of B.Sc second year, was returning from Hedua in north Kolkata to her home near Dum Dum by bus no 30B/1 today noon. She often travels by the same bus after attending tuition, and according to her, the man did the same a fortnight ago. “On that occasion, he had taken out his male organ and masturbated while ogling at us. I kept mum that day out of fear but today I shot his video so to expose him,” the college girl wrote in her FB post. 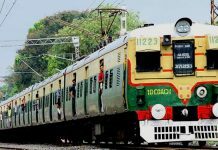 Das has also alleged that despite several other passengers being on the bus none stood up against the man even after she drew their attention. Soon after her FB post that went viral, Kolkata Police registered a suo motu FIR and launched a manhunt for the accused. Around evening police were able to arrest Rai from Shyambazar area. The news was posted by Kolkata Police on their FB page along with a photo of Rai. He will be produced in a city court tomorrow and police are likely to pray for his remand.